It’s that time of the year when red, white and blue is showing up everywhere. 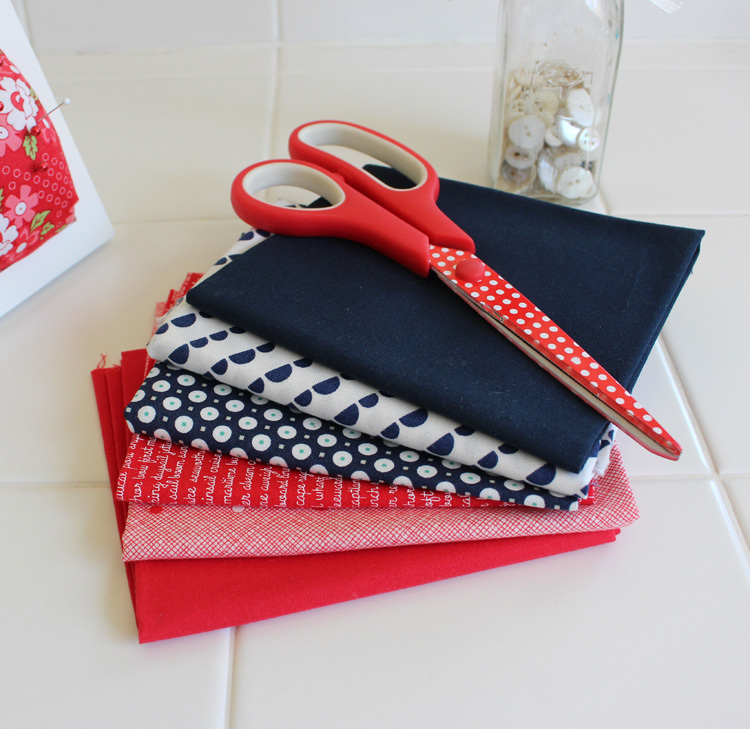 It’s also the perfect time to start sewing with some of that beautiful color combination. I pulled some fabric to inspire me; I just love this mix of fabrics from my Bonnie & Camille collection. I recently finished sewing on the binding (using my all machine binding tutorial) on this version of my Star Spangled Heart pattern. It’s such a quick and fun pattern to make! Sale alert! For the rest of the month of June, you can find this pattern on sale for $6 here. This is a digital pattern only and it includes two different size options: 18 1/2″ square and 10 1/2″ (corrected) square. There are also alternate layout and setting ideas (not instructions) if you want to make it into a larger project. One of the alternates is the nesting sawtooth star shown below. For the nested sawtooth star, you would make the 4 1/2″ size sawtooth star but substitute plain squares for both upper corners where it calls for half-square triangles. This 4 1/2″ unit would replace the 4 1/2″ center square of the larger sawtooth star. The other day, one of my neighbors had some old furniture items in their front yard that were labeled “free”. Most of it was junk, but I spotted this old, white spindle chair that I couldn’t resist. Mr. Crafty Quilter cleaned it up for me, and now it’s my new photo prop! I like the weather worn look and it’s perfect for this patriotic duo. I’m thinking that 18 1/2″ square size would make a great pillow, too. Something to add to my list, perhaps? How about you? 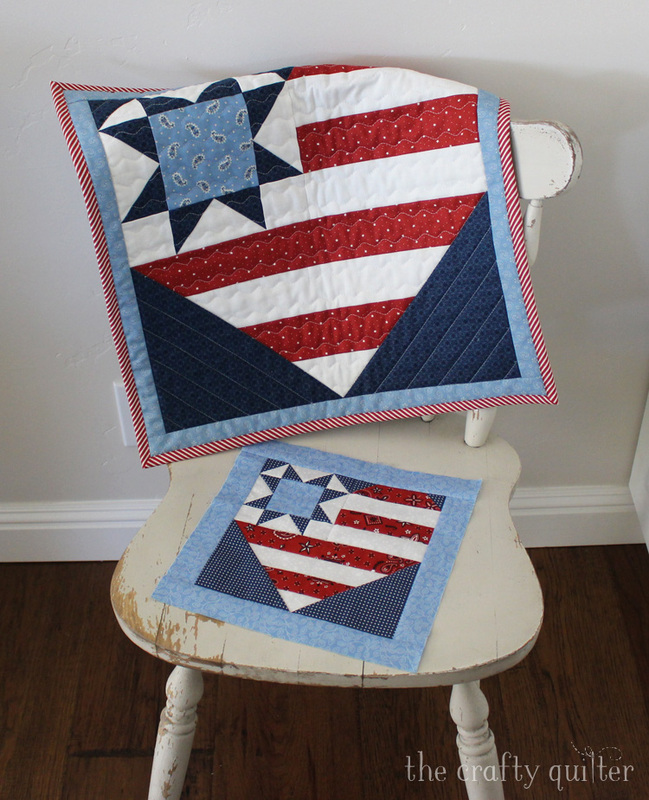 Do you have any red, white and blue projects on the agenda? 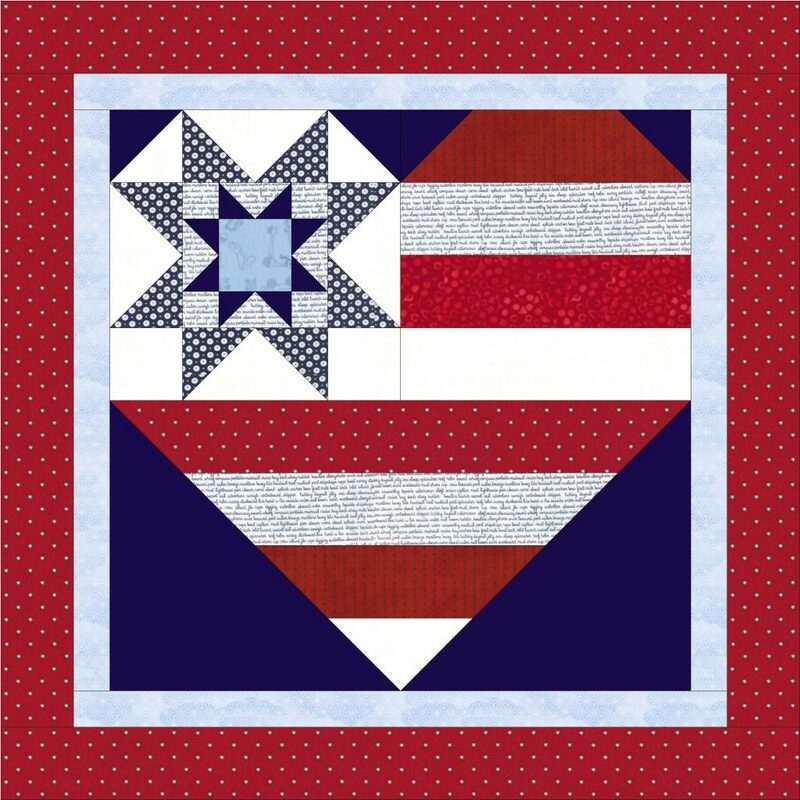 If you need some ideas or inspiration, check out All People Quilt’s Patriotic Quilt Patterns. You’ll find something star-worthy for sure! Finished my Star Spangled Heart tablerunner just in time for the red-white-blue show and tell for the guild meeting on Tuesday and the 4th on Wednesday! Thanks, Julie, for creating such a cute, fast and easy project! Love it! Must bookmark it for future consideration. Am working on a red, white, and blue project right now, which might get finished if I don’t keep making so many mistakes. Absolutely love it!! I’m checking my stash….hope I’ve got some pretties in Red, White, and blue. 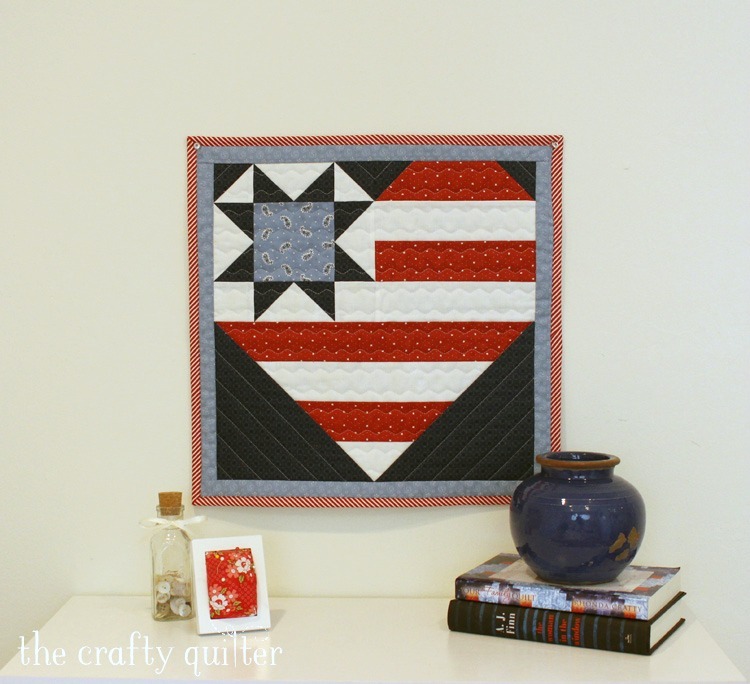 I absolutely love your Star Spangled Heart Pattern! I bought it last year. I made 2 of the 18 1/2″ pattern size as mini quilts to hang on my wall. Oh how I love them! I’m making a pillow right now in the 18 1/2″ size as well & also the big quilt all from Bonnie & Camille’s line called Daysail! Eeeekkkk! I’m so super excited!! 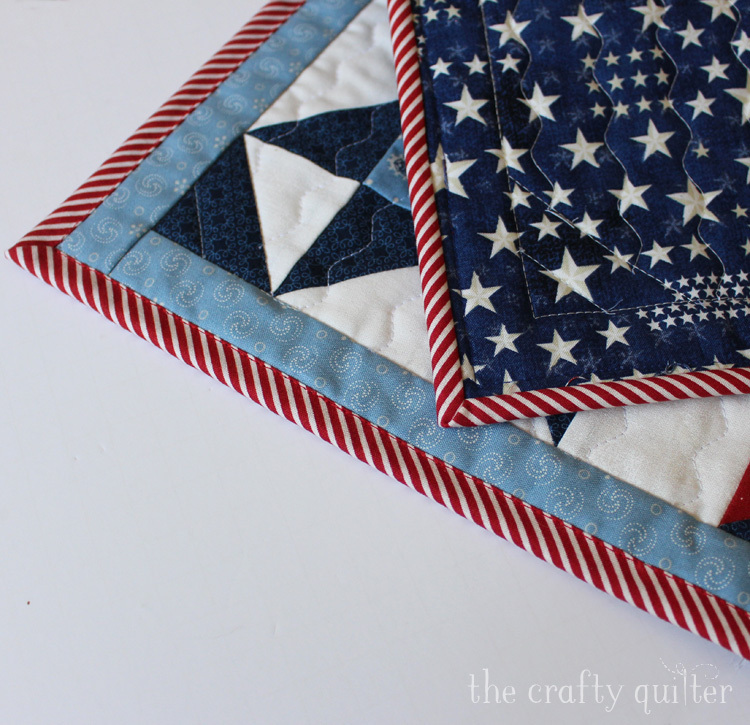 This is my very most favorite patriotic pattern I’ve ever made! And all in a heart!! Just doesn’t get any better than that! Right? For all of you buying this pattern you will absolutely love it! In fact you’ll make more than one!! The pattern I found so perfect & easy to follow! Thank you Julie for this beautiful pattern & sharing it with all of us!! I’ve had so many compliments on my mini quilts I made!! Hi Julie! 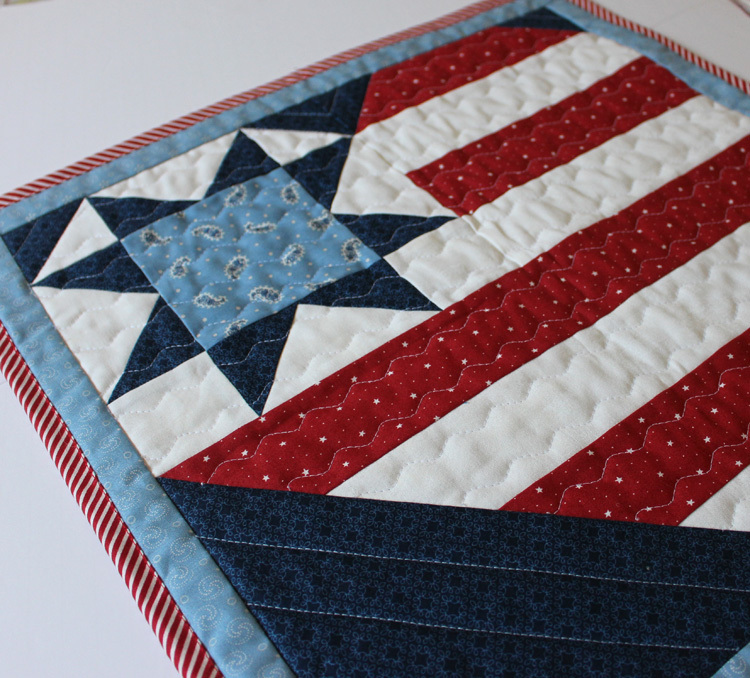 I am looking for a pattern for an American flag….any ideas? Love this one! I ordered it and cannot wait to get busy on it. How cute! I’m going to make this one! Thanks for all your inspiration! What lovely fabrics,just in time for July 4th.